TransLink has put in place another change as part of its 10-year plan to ease congestion and increase transit service in Metro Vancouver. 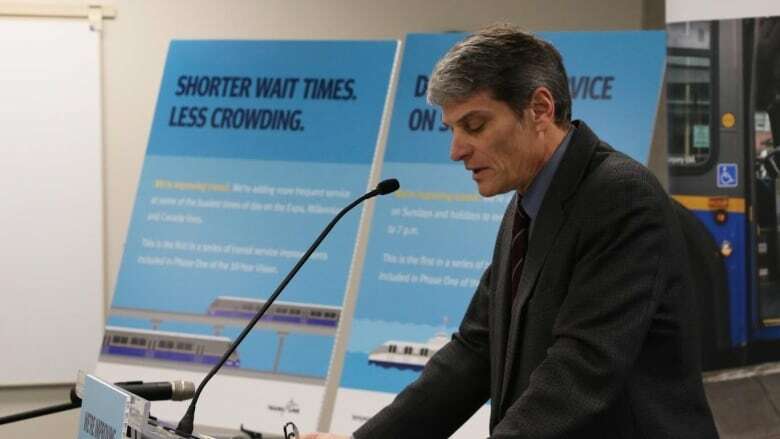 TransLink has put in place another change as part of what it calls its 10-year plan to ease congestion and improve transit service in Metro Vancouver. On Monday, it announced it will add 85,500 HandyDART trips in 2017. "We know that HandyDART is so much more than just moving individuals from point A to point B," said Tim Louis, co-chair of the HandyDART Riders' Alliance. "If somebody gets a trip turned down, they are homebound for the day. They are sentenced to house arrest." Louis says the increase in service will help people with mobility issues better access the workforce and volunteer opportunities in their communities. 'When people are in their community, making use of goods and services, we all benefit — the neighbourhood is made stronger." Currently, HandyDART makes 1.2 million trips each year and has 23,000 people registered with the service, said CEO Kevin Desmond. The budget for the service in 2017 is close to $52 million, an increase of $2.4 million over 2016. "Over the next three years, additional investments in HandyDART outlined in phase one of the "Vision" will add a total of 171,000 more trips per year," TransLink said in a statement. "[That represents], a 15 per cent increase in service availability." Still, Desmond says taxi service will continue to make up part of HandyDART. He says calling cabs to get people around when other ways aren't available makes up 10 per cent of trips. "It needs to be part of the service," he said. An 11 per cent increase in passenger capacity during peak periods on the Canada Line. Extended weekday peak-hour service and increased midday and early evening service on weekends on the Expo and Millennium Lines. Doubled SeaBus service on Sundays and holidays to sailings every 15 minutes from 10 a.m. to 7 p.m.
TransLink is expected to roll out expanded bus services across the region in April.